Are you looking for an activity for your staff that everyone will enjoy and be able to participate in regardless of gender, age or sporting ability? Paintball is the perfect team-building event! At Delta Force Paintball we’ve been arranging corporate days for over twenty years for thousands of companies large and small and we have built up a great reputation for quality and service that’s second to none. Our network of 35 UK paintball centres are conveniently located close to major towns and cities in the UK and offer plenty of parking and room for large coaches. On arrival, players are equipped with the latest protective paintball equipment to ensure you remain protected and look the part. Our paintball gear includes full head goggles, camouflage combat suits and custom-made padded body armour to help reduce the impact of paintball shots. We also have upgrades available; how about replica M16 paintball guns for the managers? Or a fetching comedy suit for the Sales Director? You decide. Plus we have an extensive selection of paint and smoke grenades available to add further excitement to your day out bonding with your colleagues. 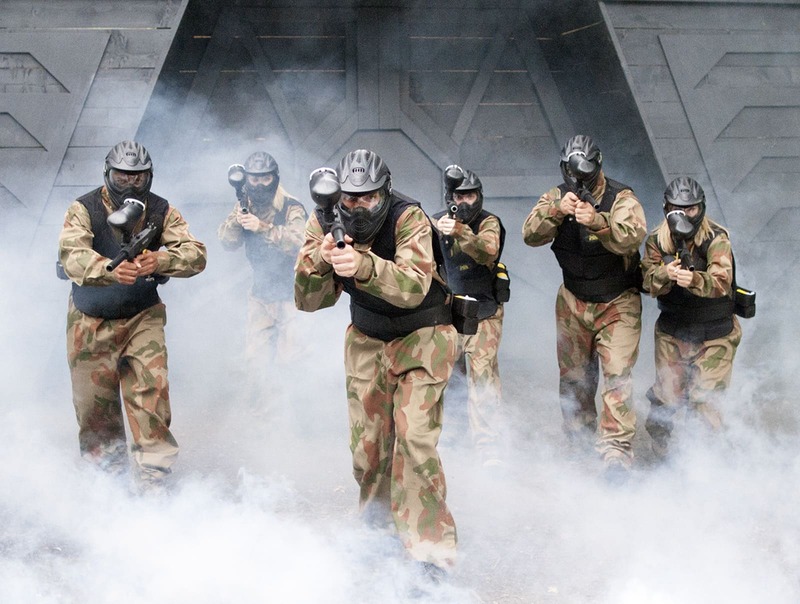 Paintballing is great for team-building with thrilling objectives to overcome; you’ll be rescuing hostages, with props such as military vehicles, helicopters, fighter jets as well as full size stone pyramids and fortresses that will be sure to impress, so it’s not your average paintball venue. In each themed mission you’ll have to work as a team to be successful. We’ll put you into teams of about ten to fifteen players and it’s up to you to decide who is in each team, perhaps the sales team versus Human Resources or just good old fashioned everyone versus the boss! We offer a full day of action and adventure from 9:15am until approximately 4pm unlike other corporate events such as karting or clay pigeon shooting where you only get a few hours of activity. If you have a larger group we can also offer bespoke times to suit your working day, as long as there is sufficient daylight to play the games. At the end of the day there is a presentation where we announce the winners and commend the losers. So if you are looking for a fun team-building activity to keep everyone happy that’s also good quality and offers really great value for money then get in touch and we’ll make it happen! Our event coordinators are available 24/7 on 0203 869 9301 or alternatively you can book online.